An unfriendly or possibly even aggressive display of behavior from your dogs towards other dogs is undoubtedly a serious issue. Unfortunately it is not something that will simply go away and has the potential to escalate so it is best to take action. Much depends on how long your dog has been exhibiting this behavior. Sometimes, successful behavior modification will mean that your dog can be helped to tolerate other dogs as they pass by rather than lunging out. 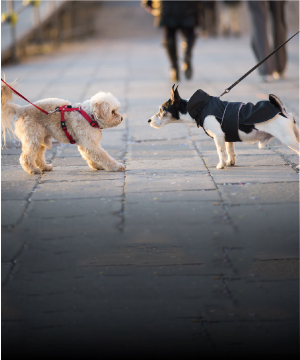 Your dog may never play with other dogs, but walks can be pleasant. This workshop seeks to teach owners how to identify problematic behavior and patterns and what course of action to take to ensure everyone’s safety. Below is a listing of the current and upcoming Cooperation Between Your Dog and Other Dogs workshops. Group classes require at least 6 attendees, please bring your dog. The price for each session is $40 (+HST). There are no refunds or make up workshops for not attending. I entrusted my Zoe with Deena when it became obvious that Deena has so much love and passion for dogs. To me, this was also backed by her extensive professional training and her association with so many trusted and credible canine organizations. Deena does speak dog and therefore speaks Zoe and this is what is most important to me.